Cleaners Putney is able to provide high quality end of tenancy cleaning services at competitive prices. This is one of the most common services we offer in Putney, London. Depending on the size of your property it will take between 4 to 6 hours for professional deep cleaning of the house or flat you rent. Our end of tenancy cleaning solution could be combined with professional carpet or upholstery cleaning. Our cleaners have many years of experience, they are background checked and fully vetted. The move out cleaning service offered by our company has a guarantee of 48 hours which means that we can send our team back for free if your landlord is not satisfied with the cleaning standards. What you need to do is just book the service 24 hours in advance and we will send the team according to your request. We are able to send you professional cleaners seven days a week, even during the weekend at no extra charge. Usually we send a team of two or three professional cleaners, plus a carpet technician if you need professional carpet cleaning. All of the use advanced cleaning equipment and tools. 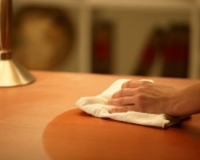 Below you can find some of the tasks included in our end of tenancy cleaning service. If you have any questions just give us a call and our friendly team will be glad to assist you.